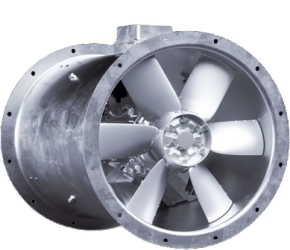 Our JMv product is a fully cased axial flow fan which offers high efficiency performance. Each impeller is manufactured from high-pressure die cast aluminum, which is X-ray inspected using real time radiography (in accordance with ASTM E-155) to ensure product integrity and quality. Impellers are precision balanced to minimize vibration levels and assure smooth operation. Impeller blades are mounted into a hub and clamp plate assembly, which allows manual blade pitch angle adjustment that offers performance flexibility. Our design incorporates our innovative “VCC” technology, which uses high twist blades, blade features, an aerodynamically optimized hub design and integral 2-stage guide vanes to deliver outstanding energy saving performance.